In a move that will surely send irony meters off the charts in the nation’s “blue states,” the recently dedicated George W. Bush Presidential Center will open on May 1 with a LEED-Platinum certification for a wide range of energy-saving attributes and sustainable design features. 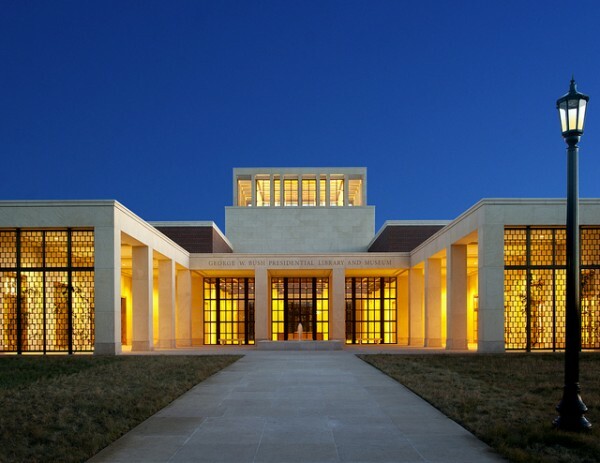 The Bush Center, located on the Dallas campus of Southern Methodist University, is the first of all the presidential libraries to reach the Platinum threshold. The 226,000-square-foot library and museum was designed by Robert A. M. Stern Architects and built by Manhattan Construction, which also built the LEED-Platinum University of North Texas Apogee Stadium in Dallas. The entrance to the LEED Platinum-certified library for President Bush. Image via George W. Bush Presidential Center. Manhattan Construction, a member of the U.S. Green Building Council, oversaw daily control of specialized materials and the recycling of construction debris in the team effort to achieve LEED certification. Most of the building materials were locally or regionally sourced, and contained at least 20 percent recycled content. Some of the native wildflowers and other greenery on the library’s 15-acre campus. Image via George W. Bush Presidential Center. 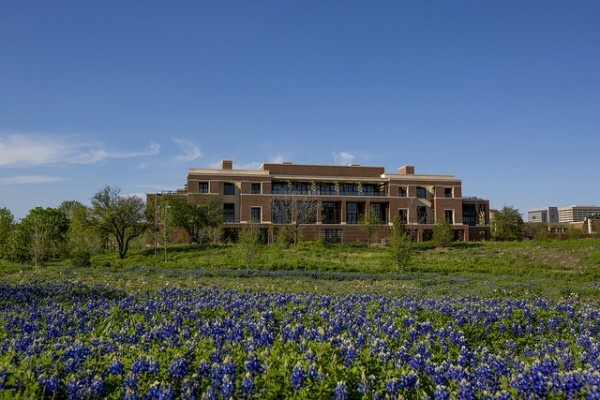 The Bush Center includes photovoltaic panels to produce 9.5 percent of the building’s energy demand, as well as solar hot water panels that provide all of the hot water throughout the facility. In several places, deep overhangs were included in the design to reduce solar gain and provide cooling shade during the hot Texas summers. Windows also contain an insulated glaze to reduce heating and cooling loads. The central “Freedom Hall” inside the Bush Library. 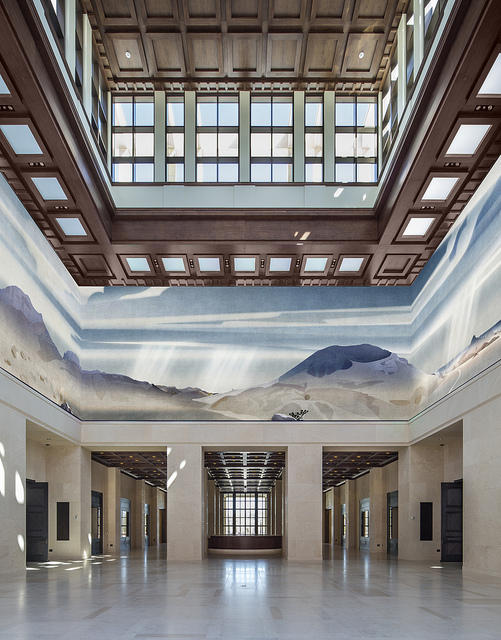 Image by Peter Aaron/Otto for Robert A M Stern Architects via the George W. Bush Presidential Center. The building, which includes the George W. Bush Library, his presidential archives and a museum, was dedicated on April 25, with dozens of dignitaries present, including the five living presidents: Obama, Clinton, Carter and both George H.W. and George W. Bush. “We are proud to be recognized for our emphasis on sustainable building design,” said Mark Langdale, president of the George W. Bush Foundation.